A tough-talking South Africa stand between Nigeria and a 10th women’s AFCON title when both teams clash in the semi-finals of the tournament tonight in Limbe. After a difficult start during which they were held by Zimbabwe, they smashed past Egypt 5-0 to go into this clash with their confidence sky-high. Banyana Banyana's confidence will be further boosted by the fact that they edged past the defending champions in the 2012 tournament in Equatorial Guinea. “We are capable of shocking Nigeria,” declared South Africa striker Jermaine Seoposenwa, one of five different scorers against Egypt at the weekend. “The goals we scored can only be good for our confidence going into this game. Banyana coach Desire Ellis was equally bullish about her team’s chances in only her first major championship as coach. “In football nothing is impossible, you just have to have the belief,” said the former Banyana skipper. Ellis will come to face-to-face with a friend and former Nigeria captain Florence Omagbemi, who is also calling the shots in her first major championship from the sidelines. “I am happy to play against her (Ellis), she’s also looking forward to the game,” said the Super Falcons coach who in her playing day was a swash-buckling central defender. Omagbemi also maintained her team are in Cameroon to defend the title they won two years ago in Namibia. “We are fully prepared and focused. We came here to defend our trophy,” she said. Experienced defender Onome Ebi as well as tournament leading scorer with six goals Asisat Oshoala have recovered fully from knocks suffered in their last game against Kenya. Omagbemi has also been satisfied with the introduction of Ngozi Okobi in the middle of the park. 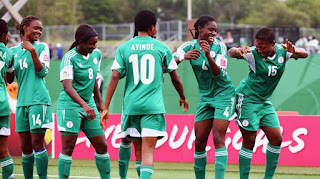 “Okobi in the middle has been a plus to the team,” she remarked. The winners of tonight’s showdown will at the weekend most likely battle rampant hosts Cameroon, who are expected to beat Ghana in the first semi-finals today.